There is a supplementary relationship in-between certain plants and animals in the biological world. It is extremely strange, such as the relation in-between eared strangler fig and agaonidae fig wasps. The order of flowers among figs is quite unique; Their flowers assume the forms of round, ellipse or pears and grow in the inner wall of the flower cavity. Since people cannot see their flowers from outside, people often call them "fig" (flowerless fruits). As a matter of fact, the fruits we often see on the figs are not real fruits, but flower pedal supports. When the eared strangler fig abloom, the top of the support would open a corridor automatically to let the agaonidae fig wasps in so that the agaonidae fig wasps could pollinate for them; because the special structure of the eared strangler fig flowers, only the agaonidae fig wasps could enter the flower and pollinate for them; without agaonidae fig wasps , they cannot have fruits and they would have no offspring. In the meantime, the agaonidae fig wasps would spend most of its life-time within the flower support of the eared strangler fig flowers, and they cannot survive without eared strangler fig flowers. This means that the two creatures rely on each other for survival. If we use a scientific term, this kind of relationship is called "co-evolvement". Eared strangler fig could grow 4 to 10 meters tall with a chest diameter of 50-60 cm. 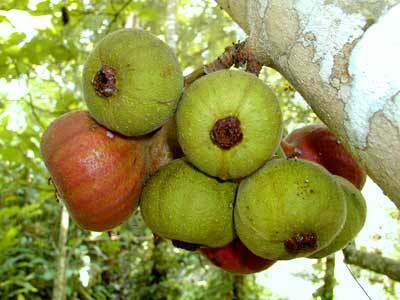 Its fruits directly grow on the forks of the tree or on big branches. They place themselves on the bottom of the tree trunks, like flat balls, which are as big as fists. Besides, their purple young leaves are also eligible and are usual wild vegetables served on the Dai folks� tables. Eared strangler fig originates from Hainan, Guangxi, Yunnan, Guizhou and sichuan etc. ; and they usually grow in humid rain forests in low valleys. We could also find them in India, Vietnam and Pakistan.